Last month we mentioned a novel idea for an “Augmented Reality” app that allows one to walk throughout a city and watch popular scenes from movies that were filmed in the exact location they’re in. If you were in Venice, California you might see a scene from I Love You, Man or The Doors, while a visitor in the Big Apple could see a scene from Date Night, Taxi Driver or Spiderman. 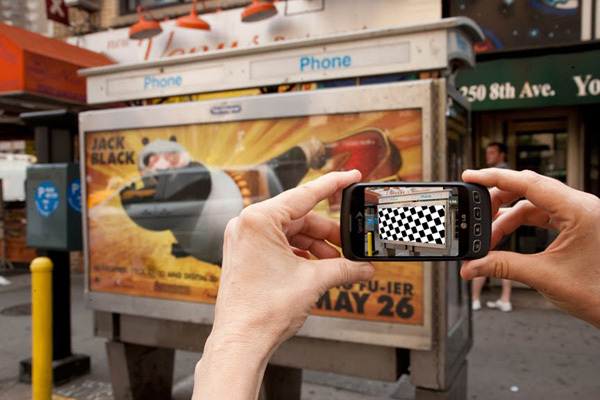 The same Augmented Reality idea used in that app is currently being beta-tested in another app that allows the viewer the opportunity to swap out advertisements on billboards and other on-site media with augmented reality pieces from some world class artists. A collaboration between Public Ad Campaign and The Heavy Projects has produced this ad hacking technology (dubbed “Augmented Reality Advertising Takeover”) in an effort to take back public spaces, and open the lines of communication between subject and object and once again. Featured artists include Ron English, John Fekner, Posterboy, Doctor D and OX.